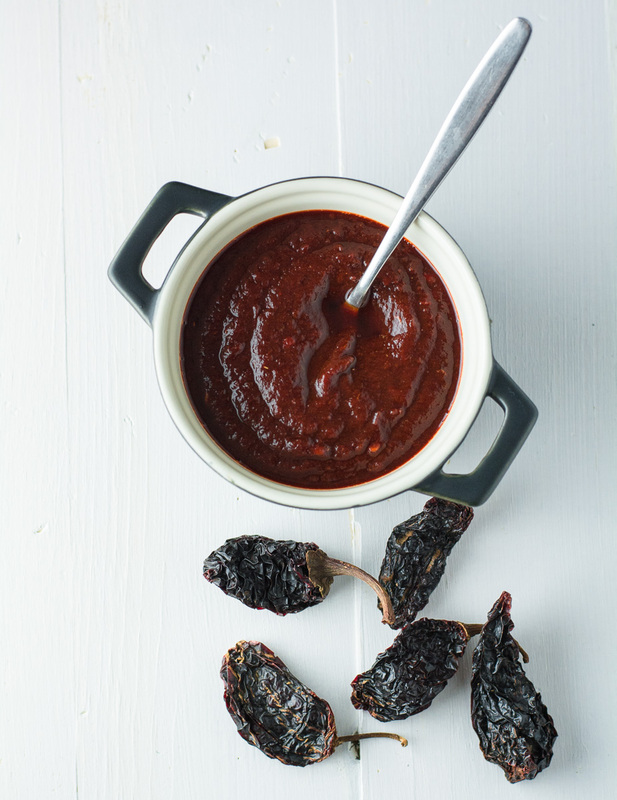 Chipotle in adobo is an easy way to bottle instant flavour. Seriously. Chipotle has become a marketing ingredient. For a limited time get the super chipotle bacon burger! This month only – the chipotle pulled pork sandwich. It’s too bad though. It really is a wonderful flavour. 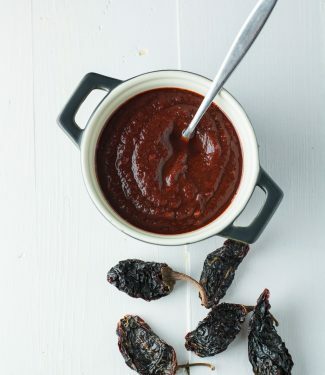 Smoky, spicy and complex.You can use it all over the place. Roast pork with a chipotle gravy. Chipotle braised beef ribs. Bean dishes. Soups. Barbecue sauce. People seem to love it. You can buy chipotle in adobo in cans and they can be pretty good. I like a puree though. Chipotle in adobo puree permeate the final dish better than finely chopped peppers. You can puree the ones that come in a can but then you are pureeing seeds. That can turn out bitter. Chipotle in adobo puree. Flavour bomb. Use it everywhere you need a bit of smoky heat. Stem the chipotles and then either slice them open with a paring knife or cut them lengthwise with scissors (safer) and remove the seeds. Heat a frying pan (cast iron works well here) to medium and toast the chiles two or three at a time until warm and pliable. This takes about 10-15 seconds per side. Combine all ingredients in a non-reactive saucepan and simmer partially covered for about one hour or until the liquid has reduced to around 1 cup. Let cool briefly, reserve about 1/3 cup of the cooking liquid, and puree the rest. Use the reserved liquid to adjust the consistency to your preference. Store in a mason type jar in the fridge. If you like it, it will keep longer than it takes to use it up. Where did you get the chipotle morita from? Really want to make this! I got them from a shop in Ottawa called Grace in the Kitchen. I imagine you could find them on Amazon? Hope you find some.